Rescue Zoombini Isle! Save the Zerbles! Excitement like this could only be found in the magical land of the Zoombinis. Sail off on a learning adventure to restore Zoombini Isle from the dastardly Bloats' destruction. Along the way, you’ll explore fascinating science topics like astronomy, mechanics, ecology, genetics, and more! Lay the foundation for math and science success by building key logic and science process skills. Discover concepts in astronomy, mechanics, cryptography, and life sciences. Delve into the food chain, ecology, and genetics. Put your wits to the test in seven intriguing interactive logic puzzles. Progress through three levels of difficulty for ongoing challenge. 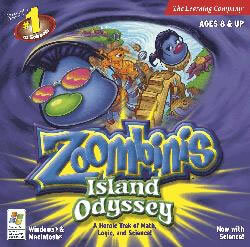 Zoombinis Island Odyssey is the third title in the award-Winning Zoombinis series! Nurture curiosity, creativity, and a love of science on an irresistible journey to Zoombini Isle! Life continued to be good for the Zoombinis. That is, until they received word about the homeland they had left behind. The dastardly Bloats had destroyed the natural habitat and then evacuated, leaving the Zerbles and other wildlife struggling for survival. Build important logical-reasoning skills and explore scientific concepts as you restore Zoombini Isle to its original splendor and ensure the survival of the wild Zerbles.